In November 2017, I visited Auckland, New Zealand (map) for the first time (I had changed planes at the airport once before, but that doesn’t count). I attended the ATRF, the Australasian Transport Research Forum, the much smaller antipodean counterpoint to the Transportation Research Board conference. Auckland is a metro area of 1.5M people, making it the largest city of NZ. It has the feel of many British colonial capitals (and their equivalents) (Toronto, Sydney) with trains serving the CBD, stopping near the Harbour (in this case at Britomart, which is, to my relief, not named for a discount store selling cheap imports from the UK, but rather after a Point, named after one of HMS, named for the Greek hunting goddess Britomartis). The Harbour should be the most valuable piece of real estate, with fabulous views. It is still a working port, and so the best views are had by recently imported Toyota pick-up trucks. Yup, the docks are used for offloading and storing cars. Money is sitting on the table. $20 bills are on the ground. I walked around the downtown area – a still vibrant area with lots of people on the street in daytime, Ponsonby Road – the main upper middle class shopping street, and took the ferry over to Devonport – an almost resort like suburb. The University is embedded in the city, but the area around the University was not nearly as active as it ought to be. That week the local Tongan population was celebrating a loss to England in rugby, and making a lot of noise near the city center. 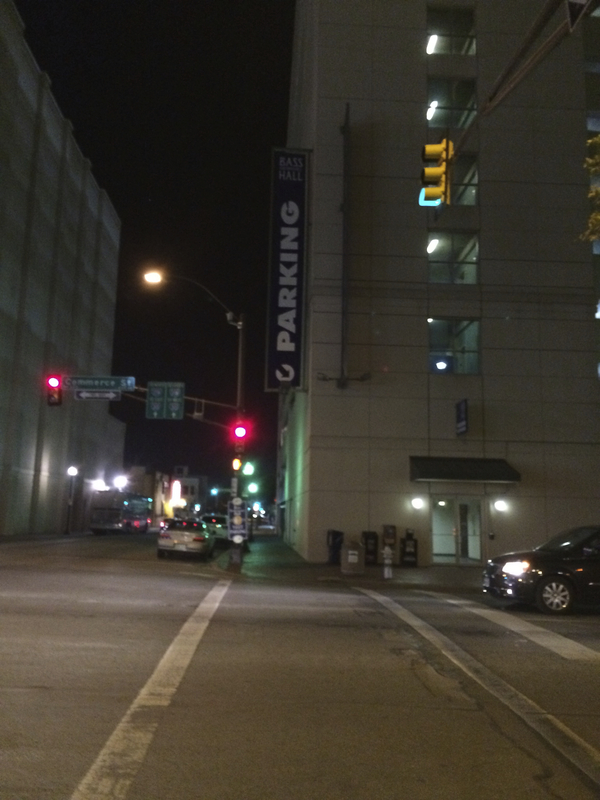 I noted that the pedestrian signals are sometimes dark instead of “don’t walk” or “walk”. This means it is up to the pedestrian’s judgment as to whether to proceed. Pedestrians can push the button if they want for guidance (for instance for a visually impaired person). This is an interesting strategy, I wonder if there is safety evaluation (Google Scholar did not turn up anything obvious). If Auckland were not so remote, or perhaps if New Zealand wanted to encourage it, the city could be many times larger, as many prospective immigrants would be happy to live in such a place. A friend from California once approvingly said Minneapolis had all the necessary hipster infrastructure. Auckland has all the necessary middle class infrastructure, and then some. Everything you have ever read about the rapid change in China understates the case. China is hotter, more polluted, and more crowded than ever, as famed taxi-driver interviewer Tom Friedman might say. Despite (or because of) this, Chinese have a surprising amount of money. The upper and middle class are increasingly large and well-off. In larger cities like Nanjing, the middle and upper classes have what appears close to a European standard of living, but for the pollution levels. In contrast with its iconic and trademarked communist branding, China is more capitalist than almost anywhere else I have been. The social welfare system is not at western levels, and the disparities between rich and poor are larger, so despite official reports, one can observe some homeless. Still, food and services are so cheap, I am not sure “purchasing power parity” really captures it. Real estate, on the other hand, soaks up the profits, and is very expensive in the neighbourhoods with good schools. People seek to be in the most expensive neighbourhood they can afford. Families who can afford it move to the neighbourhoods with the “best” primary schools, so their children will get into the “best” middle schools, so they will go to the “best” high schools, so they will score well on the national exam, so they will go to the “best” universities. I think “best” largely refers to richest, as schools with the richest kids will have the “best” peer group for later networking, as well as the “best” resources, and score well on the annual standardised exams ranking schools because the kids comes from educated families. The national exam is considered a great equaliser, as rich kids are too lazy to study hard for the exam, and don’t score as well. Admissions to university is done on a quota system, so students are ranked by state, and the top X% of each state get admitted to the best schools (school applications require a high amount of game theory here, as if you don’t get your first choice, your second choice might be full on round two, so you wind up placed lower than if you picked your second choice first). However, unlike the social services, a huge investment has been made in public works. The subway is first rate, better than anything in North America, and growth suggests it will be more extensive as well. (A GIF of the growth of Chinese metros has been going around, and is well worth viewing). The university I visited in Nanjing (Southeast University) has a brand new campus on an enormous tract of land for future growth. Overall, the museums are impressive. Feeling guilty at destroying so much of their heritage over the past centuries, the Chinese seem to be rebuilding a lot (the Porcelain Tower, for instance, various Buddhist temples) and preserving what remains. What can only be called “The Buddha Show” at Niushou Buddhism Mountain competes with the Beijing Olympics opening for grandeur. All the better since they are tourist attractions where you exit through the gift shop. Traffic in Nanjing is bad, but not Beijing (or Wuhan or Shanghai) level bad. Drivers are aggressive, but so are bicyclists, motorcyclists, and pedestrians. The safety rate is worse than Australia or the US, and the statistics don’t capture it, but not as bad as you’d think. 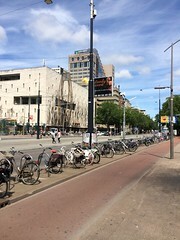 And most major roads here have protected bike lanes, which are protected except at the very confusing traffic lights (it seems traffic signals generally have 4 phases: NS Through, NW/SE LT, EW Through, EN/WS LT, and the bike lanes move outside of the car lanes, but there is lots of violations by vehicles, especially non-motorised vehicles). 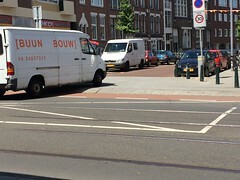 Right-turn on red, across heavy pedestrian, bicycles, and traffic flows is common, and enforcement of traffic laws is largely absent. The only enforcement I saw was against bicyclists going the wrong way down the one-way for bicycles (two-way for pedestrian) shared lane. In fact, puzzlingly, right turn vehicles have a green right arrow simultaneously with a green pedestrian phase. This would (or at least should) get a traffic engineer stripped of their license in the US. Alternatively, you might think of it as signal-controlled, temporally allocated shared space. [Which is not at all what the originators of the shared space concept had in mind]. Still given the game of chicken when lane changing or at intersections, I am surprised the crash rate is not higher. I am not surprised that many people at more than one University tell me not to trust the official statistics, though. Basically there are too many lanes for cars (relative to person-throughput, but as I said, they are congested in the peak). 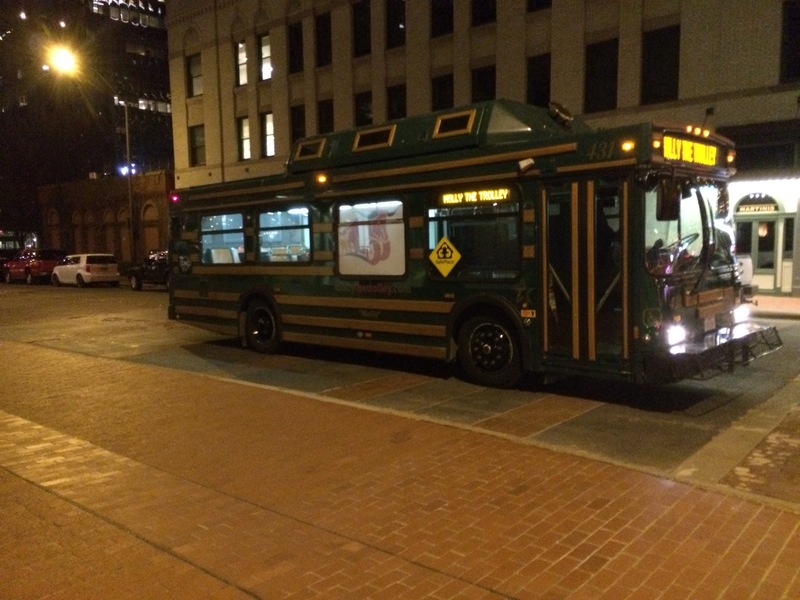 On some roads there are lanes for buses. Motorcycles and mopeds use either the motor vehicle lanes or the bike lanes, and bikes and motorcycles park on the sidewalks, so pedestrians walk in the bike lanes with bikes, mopeds, and sometimes motorcycles (including cargo bikes, cargo mopeds, and cargo motorcycles whose loads are often as wide as a truck). There is a lot of honking. Oh, and the high-occupancy vehicle diamond symbol painted on the road apparently means slow down. Those painted bars, they must be for motorbikes to wait to cross the street. The traffic lights have long cycle lengths, but all have countdown timers on both red and green phases. Stationless bikesharing. Just park your bike anywhere, and someone will come and get it and ride to the next place. No matter if it blocks pedestrians, and there are no wheelchairs and few blind people to be seen anyway. Bikesharing is the new hot thing here, it’s everywhere, and apparently all of a sudden in the last year. People get an app, deposit 300RMB and can find a bike anywhere, and leave it wherever they want, no stations required. There are lots of companies doing this, each with different colored bikes. E-bikes are also increasing in popularity, but it is still a smaller mode. Bike parking is still chaotic, and designated bike parking is not standard. Fortunately Nanjing has many street trees, and bike parking between the trees keeps bikes out of the way of pedestrians. If only this was universally adhered to. Well executed separated paths with trees for protection. The sidewalk is almost wide enough. The line down the middle of the sidewalk is common in China, to help the blind navigate. Walking surfaces are very uneven, steps are at irregular heights, and tripping seems like it should be common, or maybe that is why everyone is always looking at their feet. The Chinese have historically been good engineers, and though settlement can explain some of the unevenness, I suspect there is a deeper reason, some version of Feng Shui to defeat invading zombie ghosts perhaps? Also there are food delivery services are everywhere, like Sydney, but more so, and not like most of the US. Mostly bike delivery of course. Standardized lunchtime delivery is getting popular, like in India. So much in Nanjing is about relative status, not absolute standards. Rankings matter way more than the US, and the educational system is highly sorted. The advantage of relative vs. absolute status is that the rat race drives productivity which further improves absolute status. The disadvantage is the rat race and the dissatisfaction that ensues. 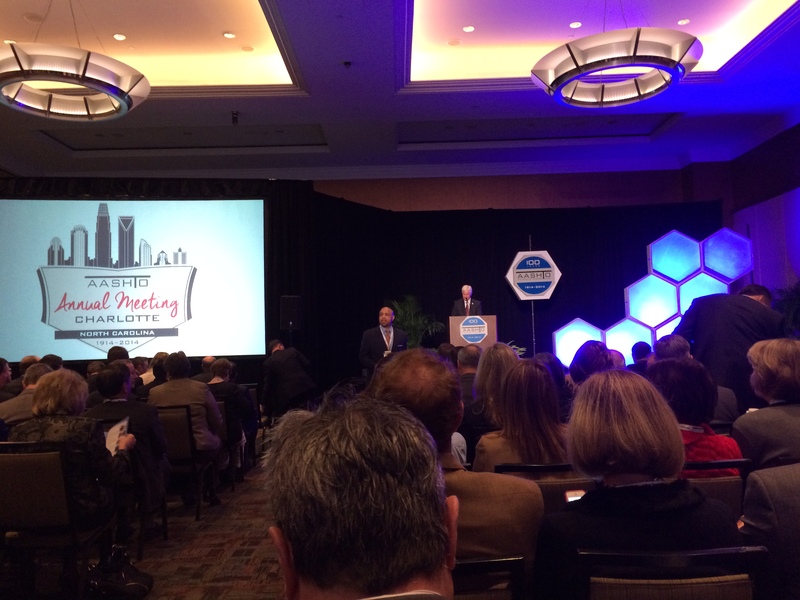 I was in Charlotte for AASHTO as the token academic. AASHTO – The American Association of State Highway and Transportation Officials (which used to be AASHO, so you know the lineage) is the organization of state DOTs, and is celebrating its 100th anniversary this year. 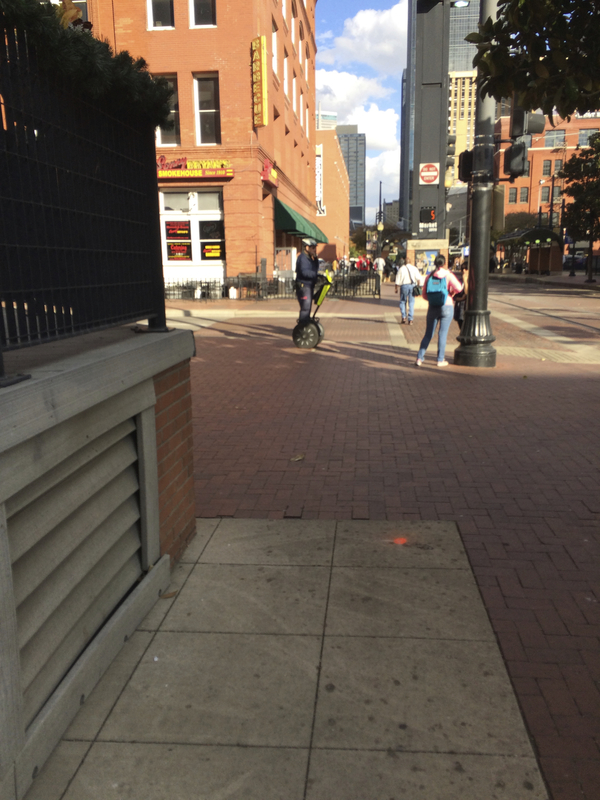 Charlotte Downtown is less than I imagined. I don’t know what I expected, and maybe I am just getting jaded, but Charlotte feels like a McDowntown, sanitized and homogenized with all of the features a downtown is supposed to have (tall buildings, bricks in the sidewalk, cultural amenities, and so on) that I am supposed to be interested in, yet it misses something by having destroyed almost everything that was there 50 years ago. Mert’s is good soul food (I had turkey sausage on rice and beans, plus excellent cornbread). The downtown has a few tall buildings, connected by skyways, but is surrounded by surface parking lots. I guess these are slated to be future development, but it would have been better to build on all of it and build shorter. Or better, leave the previous buildings standing rather than level them for parking. This Levine guy owns lots of land and is very philanthropic (the money is from Family Dollar stores). 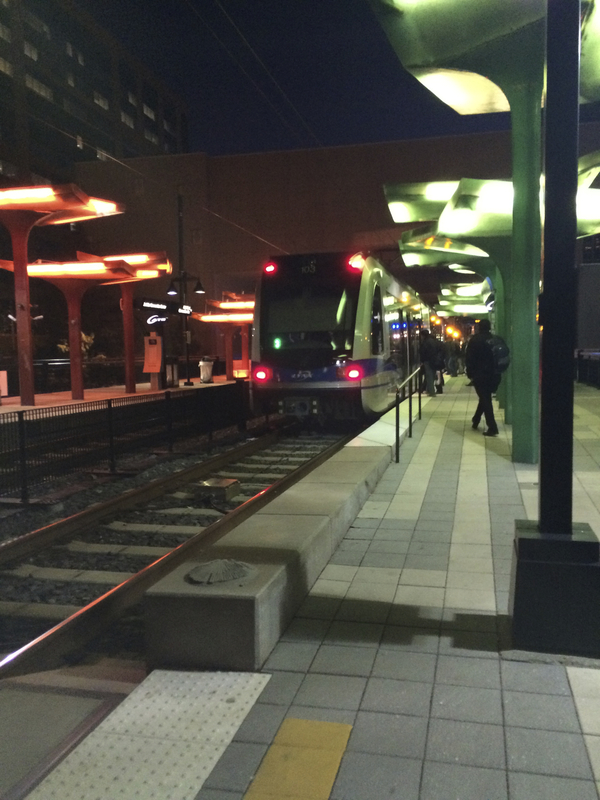 The LRT (Lynx) is a short stub through downtown (19 miles total, including built and under construction), though it is elevated in the center city. A CityLynx streetcar (1.5 miles) is under construction. There is a nice bus terminal, and the LRT is integrated into adjacent buildings. 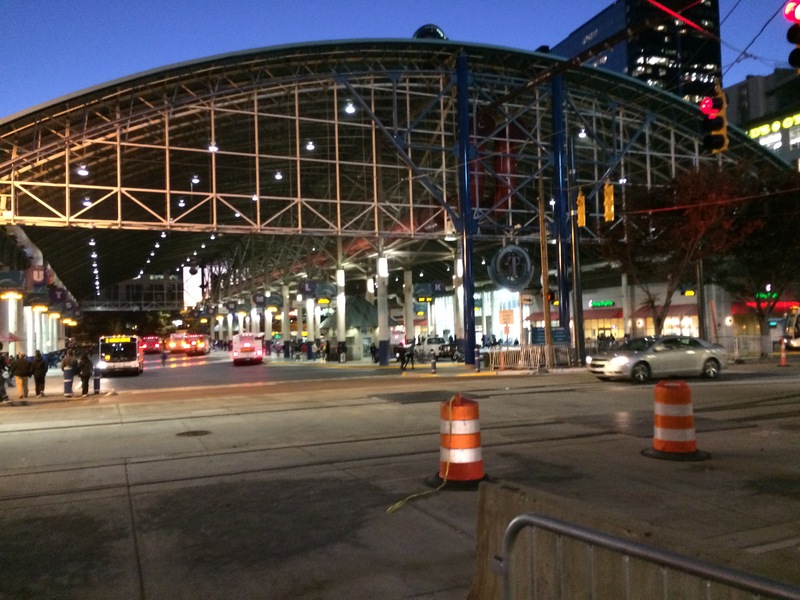 The Charlotte Transit Center Bus Hub connects to the LRT, and has passenger serving retail. This is how you do it. The Westin hotel is a nice venue. NASCAR Hall of Fame is everything you expect and more. The race driving simulator was cool, though most people seemed to crash. 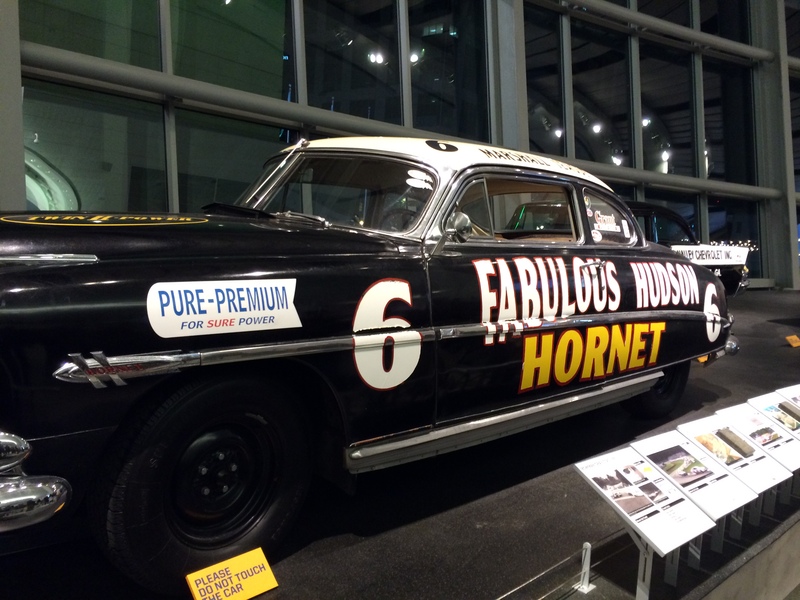 The Fabulous Hudson Hornet. It’s real, not just in a cartoon. The Charlotte Motor Speedway is an impressive operation. Though note, they did “right-size” the seating at the track. They also paint their seats random colors to make it look more full than it is. There are condominiums on the race track, that people own, most of them businesses, but some people actually live there. They are not cheap. Really, they love them some stock cars down in Charlotte. See That’s Transportainment. There really is a huge divide between Red and Blue America. Red states are both more hierarchical and respectful of authority and military, and more hedonistic with their good-ole-boys, booze, fetish for fast cars, and profligate lifestyle. It’s been a while since I lived in Atlanta, but the south (and north) are quite different. 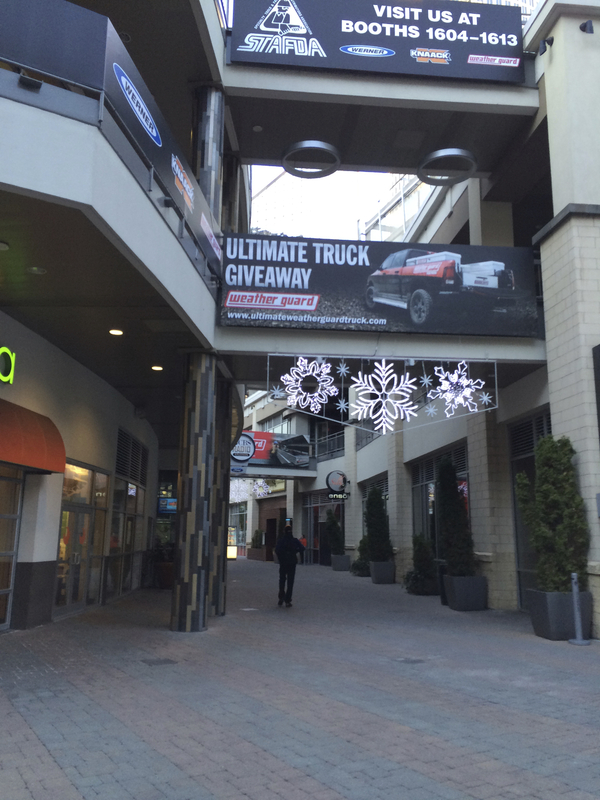 Physically Charlotte feels a lot like a small version of Midtown Atlanta. As in Texas, the Customer Service culture is stronger here than Minnesota. Airport gate attendants call out their flight to passing pedestrians to their flight. Not so much as to lure people onto a flight to Greensboro, but to help people find their flight. Photos are on Flickr. 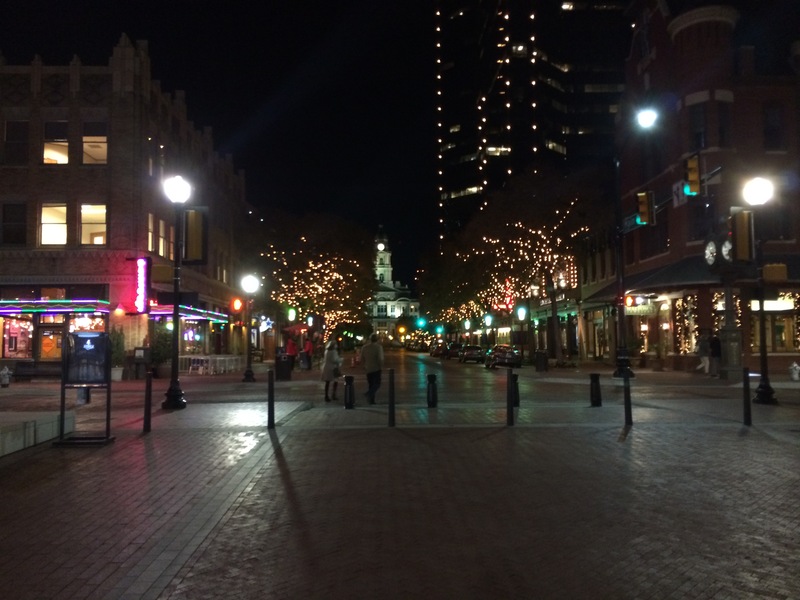 After my Fort Worth trip, I took TRE to visit Dallas and walk around there. My Pedometer records 16000 steps that day, most of them in Dallas. 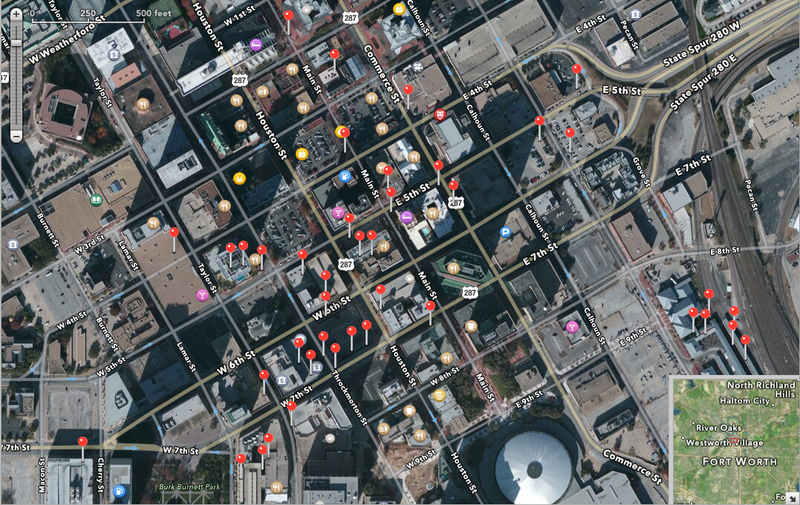 Dallas is not a particular walkable city. It has an LRT network, loading 4 lines onto the central downtown link. 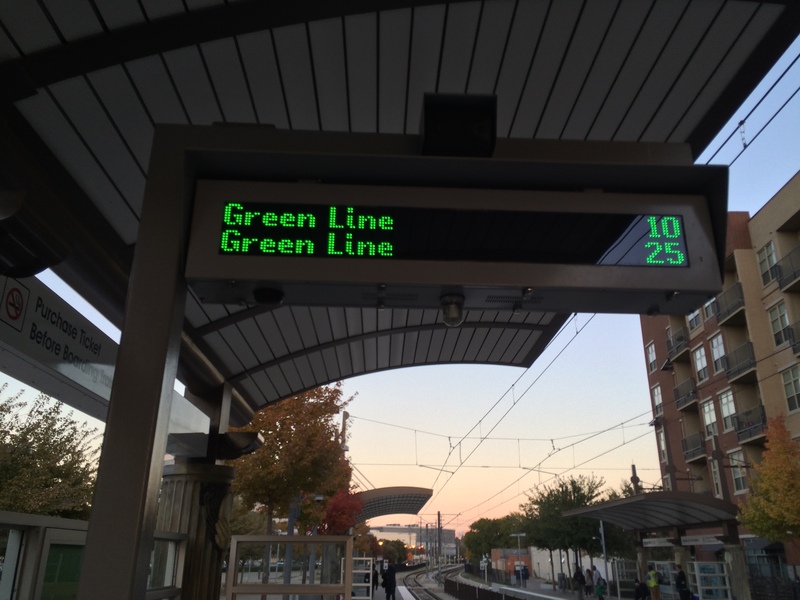 This means each line has a 15 minute headway, leaving a spacing between trains in downtown of 3.75 minutes. The 15 minute headway is not high frequency. 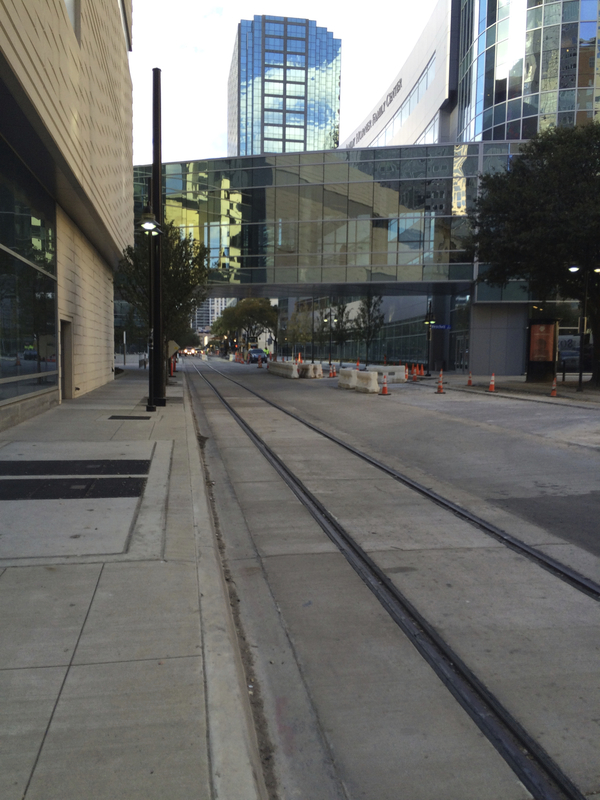 There is also a nascent heritage streetcar line, which I saw but did not ride. Streetcars and skyways are found in the Big D.
Transit Information Signs tell you when the Green Line is coming, unfortunately every 15 minutes. No need to check schedules though. 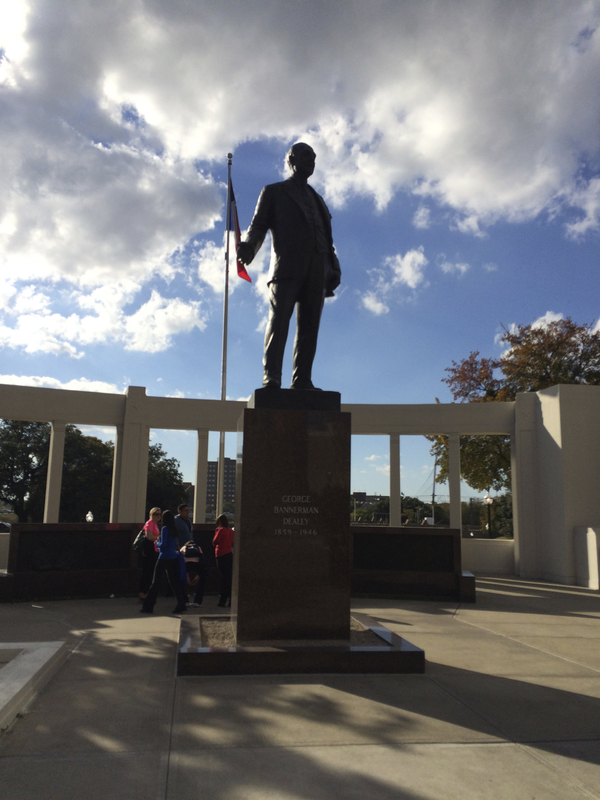 Dealy Plaza, with a statue of Dealy. A HAWK Signal, in operation. I made cars stop in Dallas. 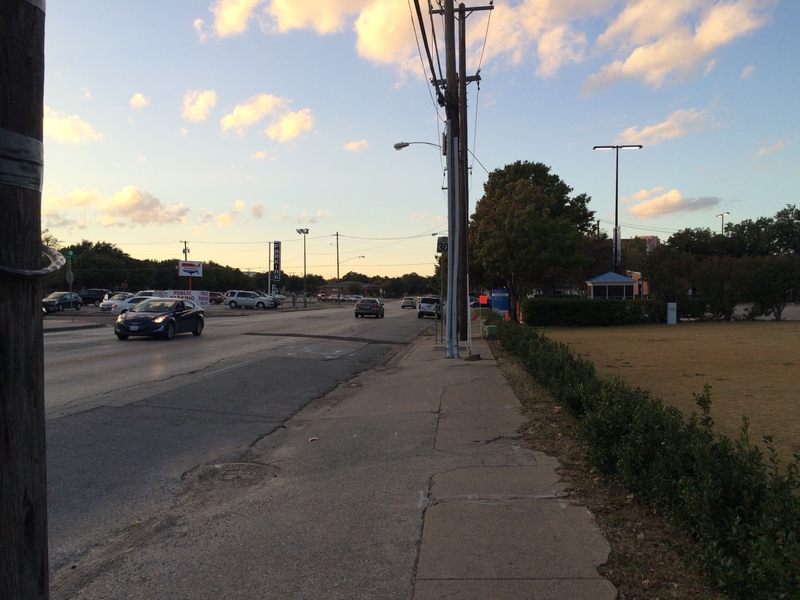 Walkable DFW. I think I was the first pedestrian. 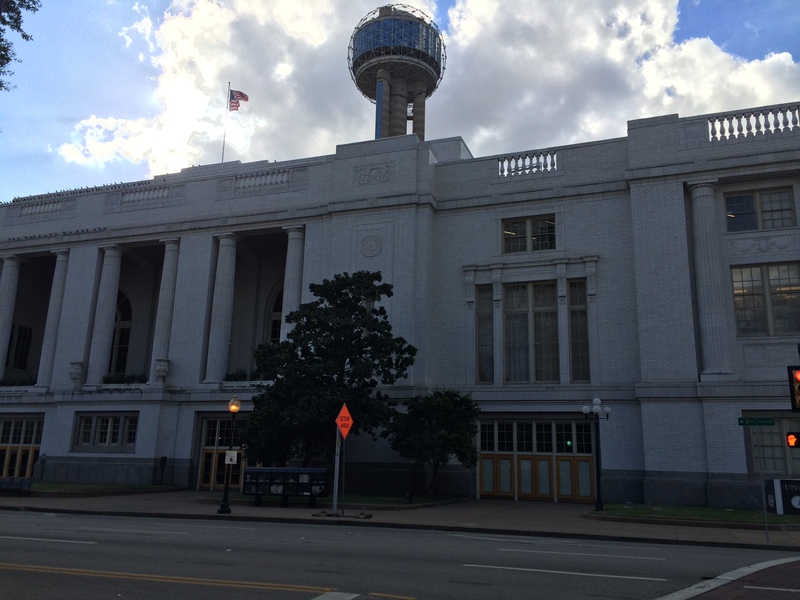 Dallas Union Station, serves the Commuter Rail TRE. Kendra Levine of the Harmer E. Davis library suggested that if I go to Dallas I visit the Book Depository. Since it was adjacent to the train station (which I discovered as we pulled into Dallas) I did so from the outside, and saw Dealy Plaza. 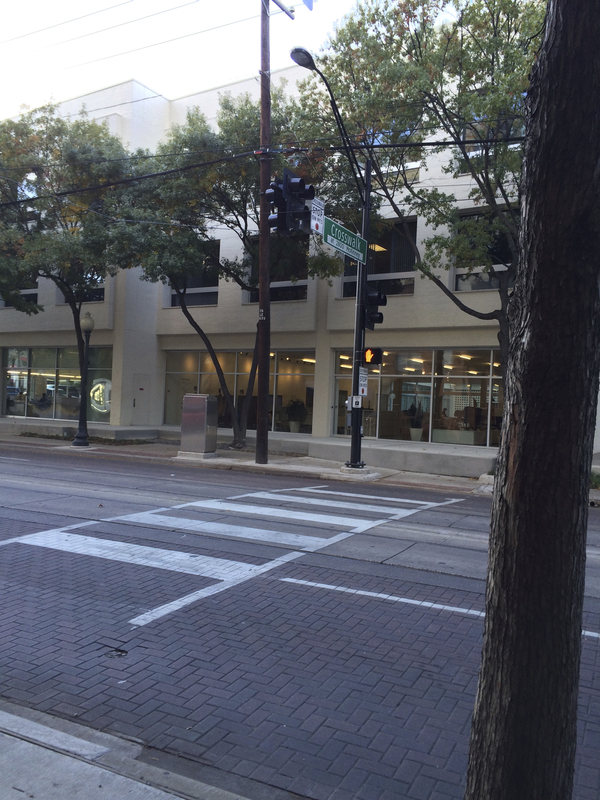 Looking at the site in person, it is easily small enough to have been a single gunman from the 6th floor of the Book Depository (now a government building), Based on the legendary reports, I imagined a much large site. Anyway, no need for a vast conspiracy on that. Oswald did it and he did it alone. 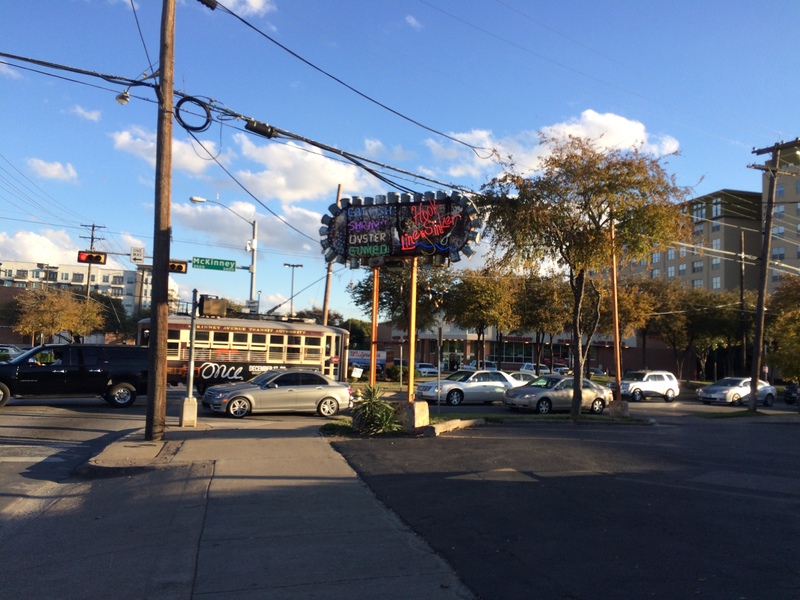 This gruesome tourist attraction is located in the historic West End of Dallas. Aside from the international tourists visiting the assassination scene, there was not a lot going on. 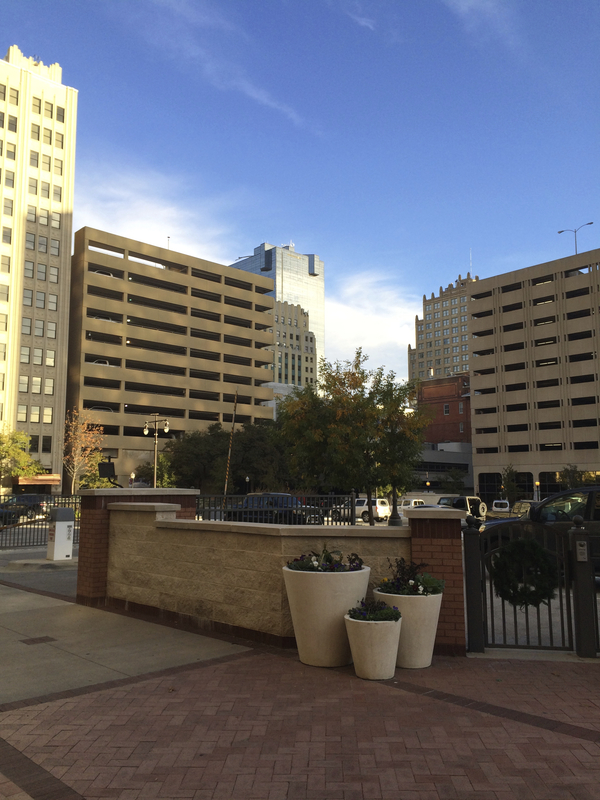 Dallas feels most like Atlanta, though it is flatter and less canopied. 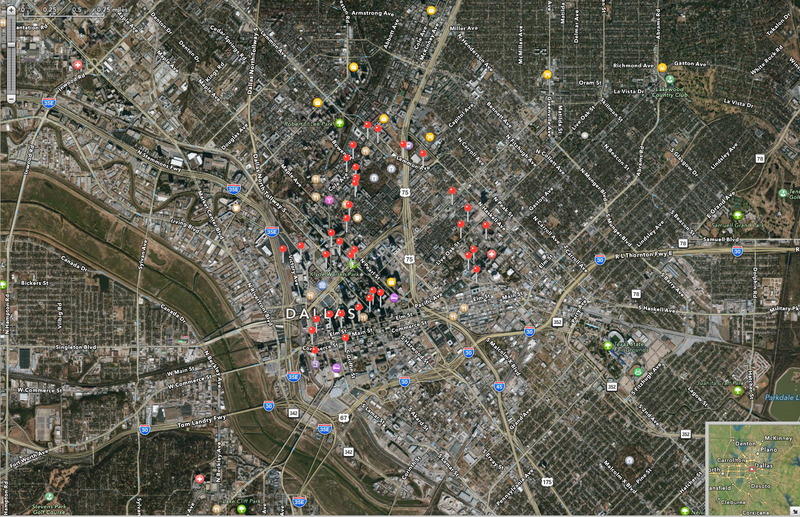 WalkableDFW has a lot of work ahead of it. Selected photos below. Check the full set of photos on Flickr. DFW airport is huge, the size of Manhattan. 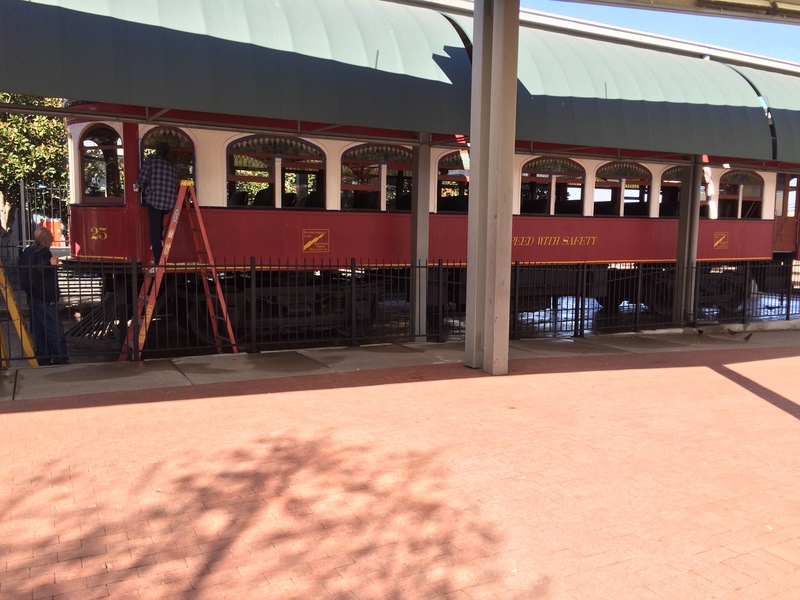 There is apparently an LRT from Dallas to DFW. From Fort Worth, the TRE in theory goes to the “Airport” but it is miles away and requires two bus transfers. Also the frequency is at least 40 minutes, and sometimes 2 hours. I visited Fort Worth recently for an AGI conference on the Future of the Methane Economy. I shared my slides previously and learned a lot. Since we were sworn to silence, I won’t discuss how I was the person there arguing that (a) CO2 emissions were rising, and (b) natural gas folks should talk about this since they do better than their fossil fuel competitors (if not as well as renewables). 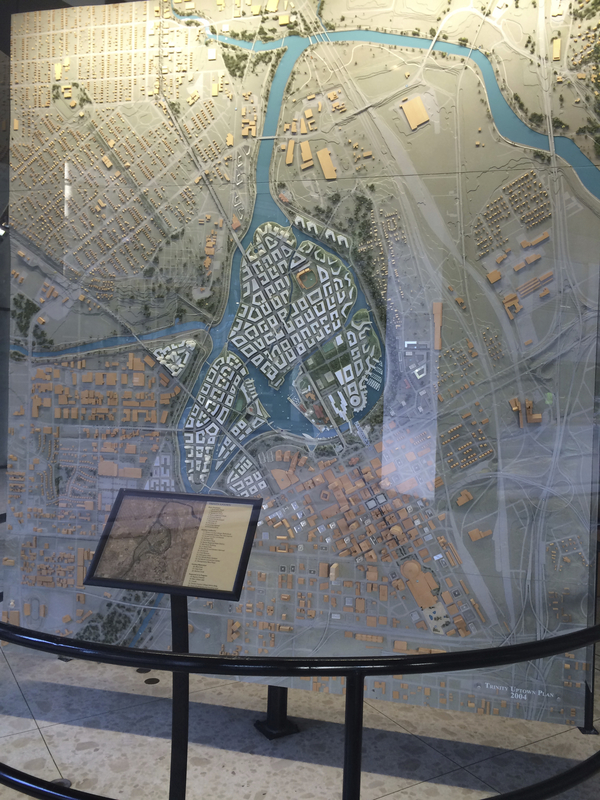 Instead I will talk about Fort Worth and Dallas, two cities I had never been to before the conference. Today Fort Worth, Monday Dallas. Even the surface parking lots are nicely dressed up. 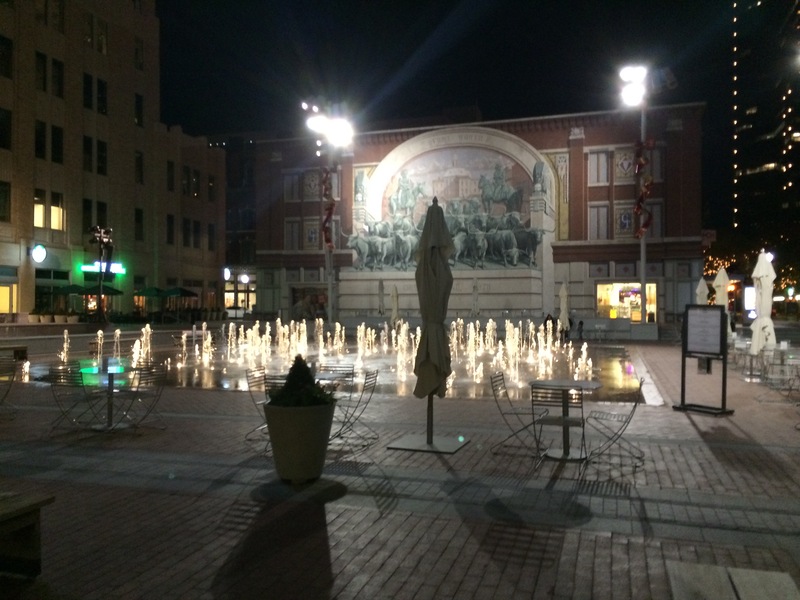 Fort Worth is the lesser known core city in the Dallas-Fort Worth metroplex. If Dallas (on I-35E) is Minneapolis (on I-35W), Ft. Worth (on I-35W) is St. Paul (on I-35E). It is less afflicted by the rush to modernity, at a smaller scale, with a walkable downtown with relatively low structures, many of them dating to the early 20th century. The blocks are square and small, the sidewalks made of bricks, the streets narrow and one-way, but the parking garages remain tall and mighty. There weren’t too many people out on the streets, and aside from the Pedal Pub I think I saw only one bicycle in 3 days. Throughout though, I felt reminded that the Customer Service culture is stronger here (and in the south generally) than Minnesota. A nice plaza facing an historic building. Football is huge. The Cowboys of course, but in Fort Worth, TCU seems a really big deal. Much more than the Vikings in Minnesota, and vastly more than the Gophers. Of course, TCU was at the time actually competing for a national championship. 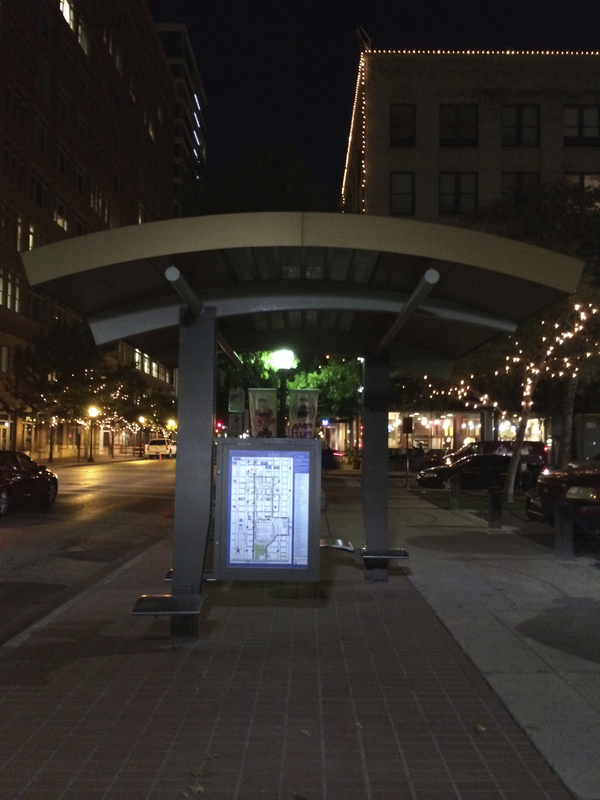 Bus stop in Downtown Fort Worth. Fort Worth is connected to Dallas by major highways (I-30), as well as TRE, a commuter rail line. 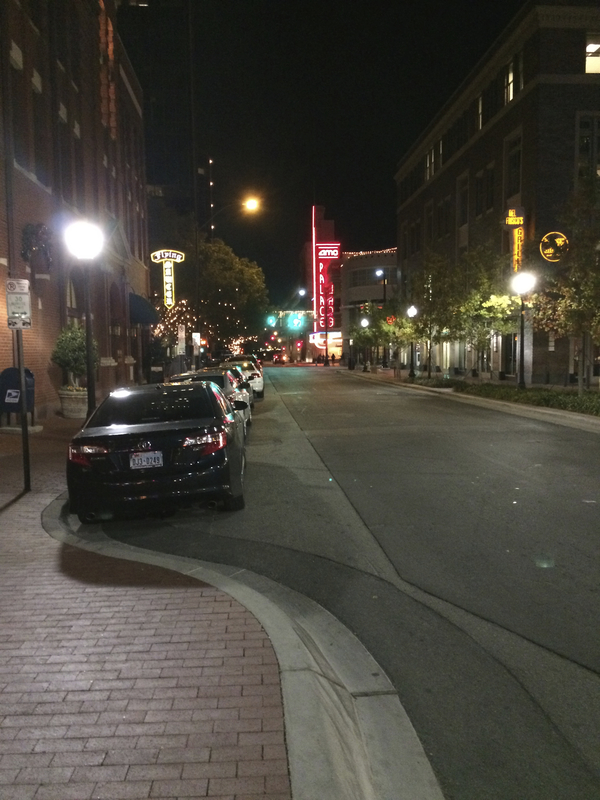 View the Fort Worth photos on Flickr. Rotterdam is one of the world’s great ports. It is also a center of modern architecture, owing in large part to bombing during World War II by the Nazis. 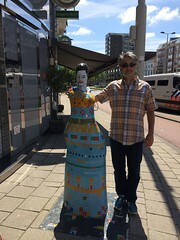 Today, Rotterdam – The Hague area (including Delft) has 2.9 M people, and so is comparable in size with Minneapolis – St. Paul. 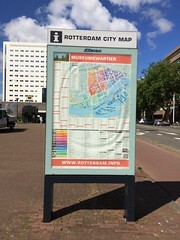 Rotterdam is about 25 km from The Hague (but only 15 km from Delft (about the distance from Minneapolis to St. Paul)). Yet unlike the Twin Cities, there are farms between the cities, the Netherlands has done much to preserve its Green Heart. This undoubtedly drives up land prices in the developed areas, and makes it more difficult to have US-like suburbanization. In general the cities of the Netherlands are not as dense as the densest parts of US cities such as Minneapolis, but the “urbanized areas” are much denser than the least dense parts of those same metropolitan areas. Some 239 photos, mostly of Rotterdam (some of the Delft train station on the way to Rotterdam), can be seen on Flickr. Selections are below. I spent the morning just walking around, and the afternoon, walking around with David King. 1. As in Delft, and Vienna, and just about everywhere else in Europe, there is a new train station. Rotterdam Centraal Station just opened, and the interior of the station is nice, and the exterior clearly exudes futurism. The plaza in front of the station is too large for my taste, and seems unprogrammed. There is a very large parking garage (ramp) under this plaza. 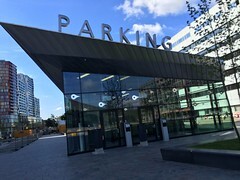 The parking entrance echoes the train station. 2. 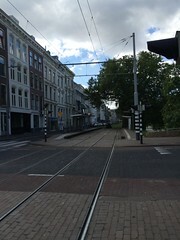 The public transit is excellent, there are modern trams on the major streets. 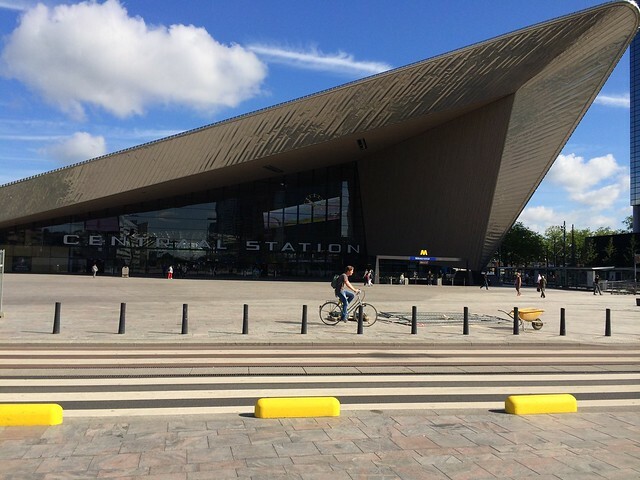 There is also a modern subway, and a new LRT connecting to Delft (as well as the intercity train), thereby providing both local and express services. 3. 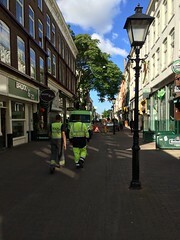 There are many pedestrianized streets. This is true both in the older areas as well as some newer developments. Absence of cars has not obviously hindered retail sales. 4. It seems as instead of hauling wet cement trucks through the city, the require construction to make it onsite, and thus only have to haul aggregate, and letting the construction firm mix local water. This reduces wear on the streets from some of the heaviest vehicles around. 5. 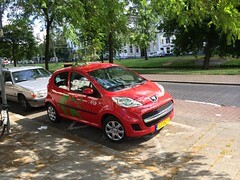 Car sharing is becoming more visible, e.g. Green Wheels are widely available. 6. 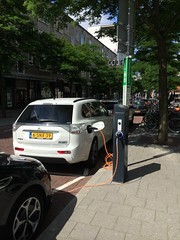 Electric vehicles, and charging stations are also becoming visible. 8. 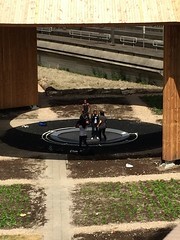 They try to make use of the area under bridges and viaducts, in this case for a trampoline. Notably the trampoline was being used and had not been obviously vandalized. 9. 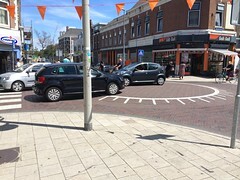 Attempts at creating a roundabout on a local shopping street using simply paint and brick patterns did not seem to succeed. 11. There are lots of wayfinding aids, moreso in the Museum Quarter. (Sadly museums are closed on Mondays). 12. Even though museums are closed, public art is pervasive. 13. 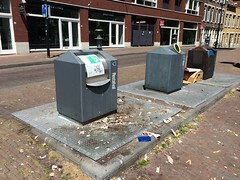 The Dutch are excellent at waste removal. Putting trash in the receptacles in the first place is a bit more difficult. 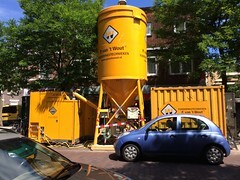 Note the receptacles are atop larger subterranean canisters, and will be sucked out with giant vacuum like devices. 14. 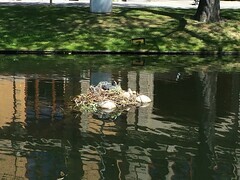 Ducks establish small well-defended Duckdoms on little islands in the canals (atop some type of pipe).